Unfortunately, not all contractors are as honest and qualified as we would like them to be. Before you even consider signing a construction contract, be sure to have a contract attorney review it. A well-written construction contract should protect your rights if your contractor turns out to be a bad one. Even if you have already signed a bad contract with an unscrupulous contractor, you may not be without legal rights. An unfair contract may not be enforceable in a court of the law, so if you failed to have to the contract reviewed by attorney before you signed it, it may be beneficial for you to have it reviewed after the fact. It may be possible for you to sue a contractor if the terms of the contract do not meet the standards of the contract law in your state. Many homeowners get in a bind because they believe that if a problem contractor doesn’t do the job right that they can refuse to pay them. This is a misconception that can lead to unnecessary liens being placed against their property, not to mention major headaches and undue stress. Contractors, subcontractors, mechanics, suppliers of materials, and sometimes professionals such as surveyors, engineers and architects are actually entitled to file a lien against a property if they have not been paid for their services or supplies. It is possible for you to pay the general contractor in full and still to get liens filed against your property if your general contractor fails to pay his subcontractors. A good construction contract will require lien releases from material providers and subcontractors, as well as a clause that protects the property owner from such liens. It is also imperative that you make sure that the contractor is licensed, bonded and insured. A qualified construction contract attorney can keep you from making costly mistakes by protecting your rights from the outset of the project. Should I Hire an Attorney in the Contract Phase? Definitely, yes! The costs of an attorney are far less than the loss that could occur if you hire a problem contractor or sign a bad contract. If you are financing the costs of building a house or home improvements, both real estate law and credit laws apply. The laws can be confusing to consumers, so it is best to have instant access to an attorney that specializes in such transactions. If you have consulted an attorney during the contract phase of the project, your attorney will be up to date and ready to answer any questions if you think that the work is not going as planned. Regardless of what the contract says, there may be laws in your state that can protect your interests when dealing with a problem contractor. 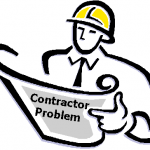 There may even be laws that will void a bad contract if you are dealing with a problem contractor. You will never know if you don’t ask a lawyer who specializes in real estate and construction contract law. It is best to get a lawyer by your side from the beginning, but it is never too late to hire a lawyer to protect your interests. Don’t think that you have to deal with a problem contractor throughout the project until the end and then hire an attorney to sue the contractor after the project is over. Legal help might be just around the corner. Once an attorney is involved, a lot of problem contractors mend their ways. If they don’t, it is possible to legally get out of the contract and to be reimbursed for damages and delays.